Get a primer on the enigmatic nation and why it's fueling international fears with its aggressive nuclear program. The division of Korea is a legacy of the Cold War. Japan annexed the Korean peninsula in 1910, and the country spent the next 35 years under Japanese military rule. With Japan’s defeat in World War II, U.S. troops landed in the southern part of the peninsula, while Soviet forces secured the area north of latitude 38˚ N (or the 38th parallel). As communism took firm hold in the north, Kim Il-Sung (Kim Jong-Un’s grandfather) emerged as the first premier of the newly established Democratic People’s Republic of Korea (DPRK) in 1948. Meanwhile, the UN General Assembly sanctioned elections held in the south, adoption of a constitution and the inauguration of the Republic of Korea, with Seoul as its capital. Since the Korean War, North and South Korea have remained worlds apart—but separated only by a 2.5-mile no man’s land. Tensions between the two governments and their powerful allies erupted into war in 1950, when Soviet-backed North Korean troops invaded the South. Fighting in the Korean War—which cost at least 2.5 million lives—ended in July 1953, with the peninsula still divided into two hostile states. 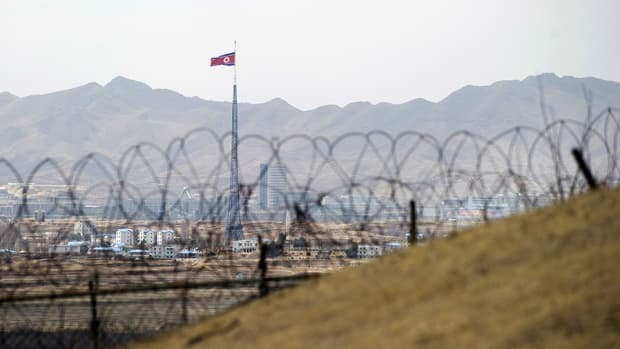 A 2.5-mile-wide demilitarized zone separates North Korea from South Korea, roughly following the 38th parallel for 150 miles across the peninsula. Established according to the terms of the 1953 armistice, this once-devastated battleground is now essentially a nature preserve, covered by forests, estuaries and wetlands housing hundreds of bird, fish and mammal species. A single family has governed North Korea for the entirety of its existence. Installed by Soviet leader Joseph Stalin in 1948, Kim Il-Sung remained in office until his death in 1994. 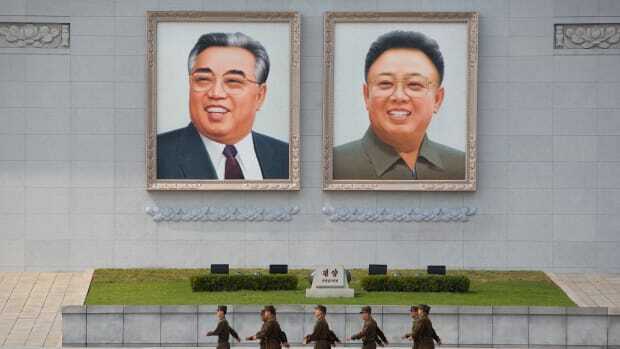 During his nearly 50-year reign, a powerful cult of personality emerged around the man North Koreans referred to, variously, as Great Leader, Heavenly Leader and even the “Sun.” A new calendar was introduced, which used 1912—the year of Kim Il-Sung’s birth—as year one. Every elementary school in the country was equipped with a special training room where young children were indoctrinated in the regime’s teachings. 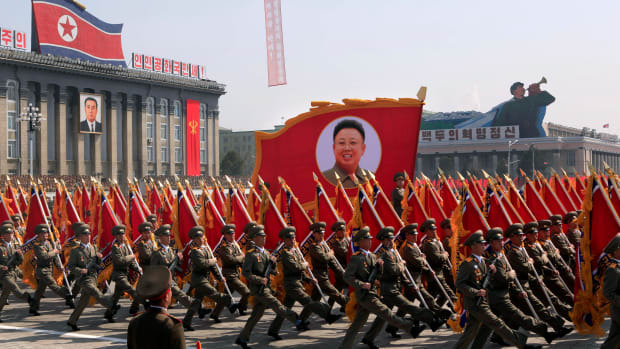 In 1998, North Korea’s constitution was amended to proclaim Kim Il-Sung the Eternal President of the Republic, and the anniversaries of both his birth and death are considered national holidays. His son, Kim Jong-Il, was the center of a similar cult, with some North Koreans convinced he was powerful enough to control the weather. Hundreds of memorial statues dedicated to the Kims dot the countryside, and despite a series of devastating famines and systemic poverty, a massive mausoleum was built on the outskirts of Pyongyang to house the embalmed bodies of Kim Il-Sung and Kim Jong-Il, now permanently on display like many autocratic leaders before them. North Korea has remained isolated from the international community, with its governmental, economic and other operations veiled in secrecy. Restrictions on travel into or out of the country and a tightly controlled press helped maintain this isolation. 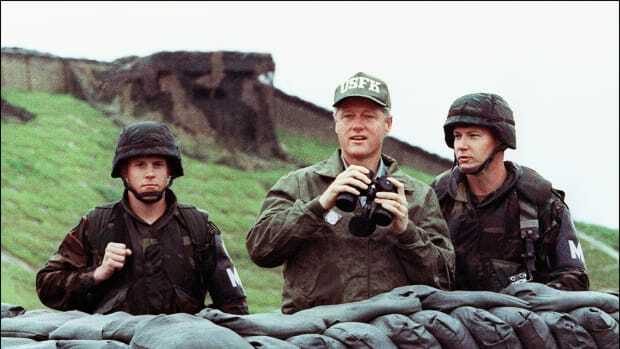 North Korea’s foreign policy has been marked by two significant alliances, with China and the Soviet Union, and by enduring hostility to South Korea and the United States. The USSR’s collapse in the early 1990s left China as the country’s most important ally, but the pattern of defiant statements and aggressive actions by the young, erratic Kim Jong-Un over the course of his reign has steadily weakened this alliance. More recently, North Korea and Russia have developed increasingly close diplomatic (and economic) ties. In 2017, Russia topped the list of countries friendly towards North Korea for the third straight year, according to Pyongyang’s state-controlled news agency, KCNA. North Korea’s pursuit of nuclear weapons is not new. Despite the fact that North Korea is generally a poor and isolated nation, it has been pursuing nuclear research for decades. Aspirations to acquire a functional nuclear weapon began during Kim Il-Sung’s reign and were built on the foundations of Cold War-era Soviet technology. According to intelligence analysts and rocket experts, some Russian engineers seeking work after the Soviet Union fell apart moved to North Korea in the early ‘90s and helped advance the country’s nuclear program. By the early 21st century, reports surfaced of underground nuclear facilities and ongoing research into the production of highly enriched uranium. Kim Jong-Il’s government carried out the country’s first underground nuclear test in 2006, in violation of an earlier pledge to abide by the Nuclear Non-Proliferation Treaty (NPT). Since then, more detonations have taken place at the same underground test site in North Korea’s northeast region, Punggye-r. Each one has been stronger than the last. Experts say that based on current trends, Pyongyang will soon have the skills to build a nuclear-armed missile powerful enough to reach U.S. shores.